Dr. Czeisler discusses why the body needs sleep and presents a comprehensive overview of the impact of insufficient sleep on the health. He begins by describing the 5 stages of sleep, emphasizing that different functions are performed during the various stages of sleep. This differentiated structure makes it important for the body to complete the entire sleep process. For example, new memories are integrated with previous memories to facilitate problem solving and creativity during the REM stages of the sleep cycle, which tend to cluster in the later stages of sleep. If the sleep cycle is consistently truncated by an alarm clock before the REM stages have been completed, these critical learning processes are not allowed to take place. Dr. Czeisler explains how poor, irregular sleep impairs brain function and creates adverse health consequences by disrupting the timing and operation of important physiological processes. Sleep allows the body to restore the brain’s energy stores, to repair brain cells, and to flush neurotoxins from the brain. He discusses an array of serious metabolic, cardiovascular, immunological, and mental health problems that stem from lack of sleep, and explains the channels through which these problems occur. 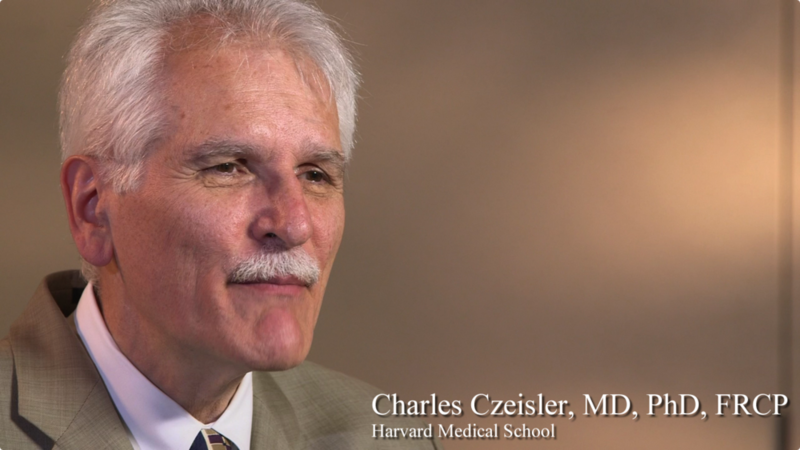 Charles Czeisler is the Director of the Sleep Health Institute, Senior Physician and Chief of the Division of Sleep and Circadian Disorders at Brigham and Women's Hospital, and the Frank Baldino Jr., PhD. Professor of Sleep Medicine at the Harvard Medical School's Division of Sleep Medicine. His research group focuses on understanding the neurobiology of the human circadian pacemaker, located in the suprachiasmatic nuclei (SCN) of the hypothalamus, and applying that knowledge to clinical medicine and occupational health. Their earliest work revealed that sleep duration and structure were regulated by the output of this pacemaker. Since then, Dr. Czeisler's lab has unmasked the endogenous circadian component of various neuroendocrine, metabolic, thermoregulatory and behavioral rhythms controlled by the pacemaker by studying human subjects under constant environmental and behavioral conditions. Current research focuses on the neurobiology of circadian photoreception in humans; the interaction of circadian and homeostatic processes in regulating sleep and neurobiological function during wakefulness; the role of melatonin in the organization of sleep and circadian rhythms; functional magnetic imaging, quantitative analysis of sleep and waking EEG; and the influence of sleep loss on the deployment of visual attention.